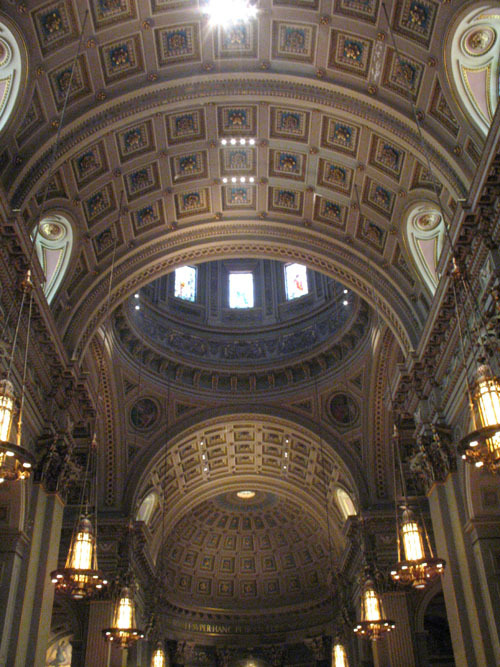 Cathedral Basilica of Ss. 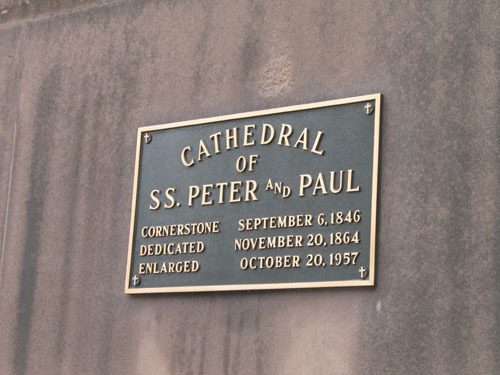 Peter and Paul recap and photo gallery. 18th St. and the Benjamin Franklin Pkwy. Parkway, baby! 18th and the Benjamin Franklin Parkway in Center City. Now, yes, considering all of the grief I've given the Archdiocese over the years, some of you might consider this a trip into the lion's den. And truth be told, part of me actually thought I'd burst into flames upon entering. Or perhaps get taken out by some high-level Archdiocesan special forces operative. A dart in the neck, maybe, or a rag soaked in incense. Fortunately, nothing of the sort happened, and I was able to escape unscathed and report back on one of the most conflictingly beautiful churches around. 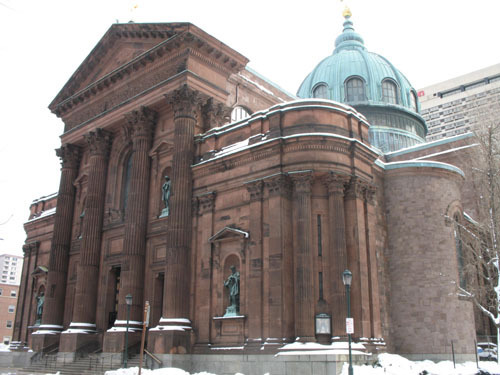 Look, the Greek Revival Cathedral Basilica of Ss. Peter and Paul is undeniably a great building. 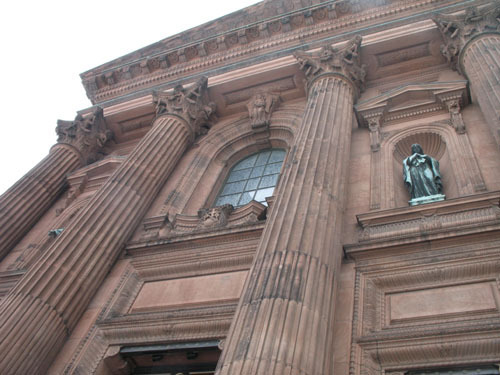 Any discussion of Philly's religious architecture has to include it at or near the top of the list. 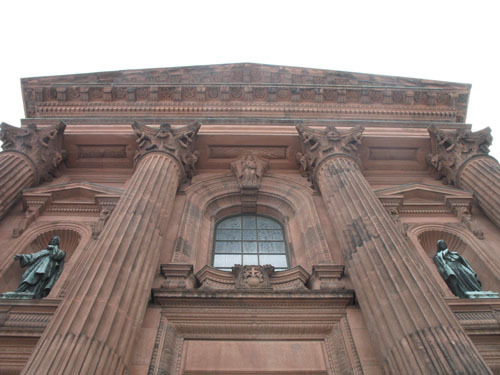 The intricately carved, columned brownstone exterior is home to an opulent, columned, cruciform interior. Soaring arches and barrel vaults. Extensive side arcades with shrines upon shrines. Mural, molding and scriptwork that puts most churches to shame. An organ that pretty much sets the standard. 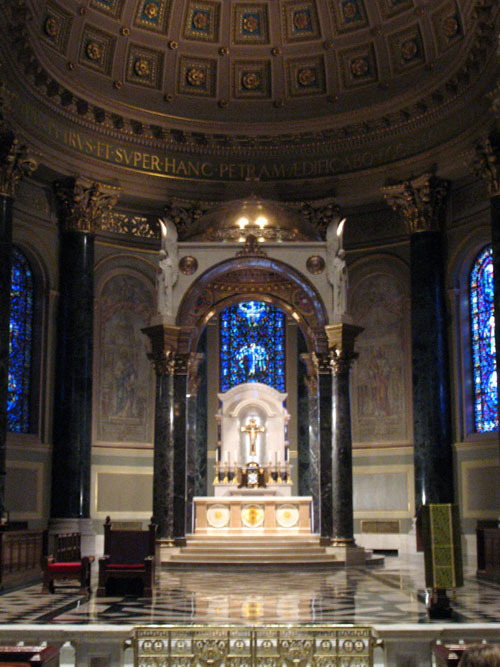 An expansive sanctuary and baldachin. And one of only a handful of true domes we've seen. Ok, so the notable dearth of real stained glass (thanks to the 1844 Nativist riots) hurts, and the brownstone exterior is more unassuming than eye-catching. Still, it's hard to find much technical fault with the place. Pimp My Church: The sanctuary actually had humble beginnings. It wasn't until 1956-1957 that it was expanded and extended into the monstrosity we see before us now. So why is the Project conflicted? And that's really the problem. Taken on its own, it's a breathtaking piece of architecture. But taken in context, it simply reinforces the somewhat unsettling feeling that this is all too much, especially given the cost it inflicts. You want to say you hate it, you want to say you're not impressed. But you can't, because it's just so well done. Hence, the Project gives it high marks. But I'm not sure I'll still respect myself in the morning for it. There's only one answer to this question, and if you have any doubt as to what it is, you need to get out more. It's the mother church of the Archdiocese, for goodness sake. Do you seriously think anything would possibly ever happen to this building? 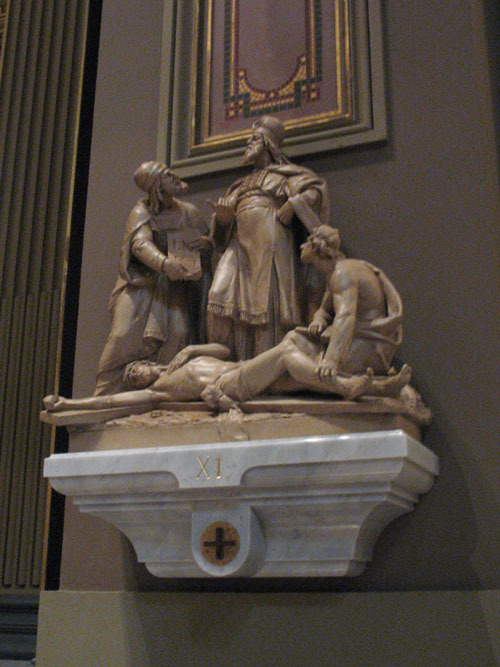 The Basilica is the AD's showpiece, its designer baby. It gets the benefit of all of its resources, money and love. Ascension of Our Lord had no roof, but hey, who can be bothered to worry about Kensington? That doesn't mean they still don't try to milk you. 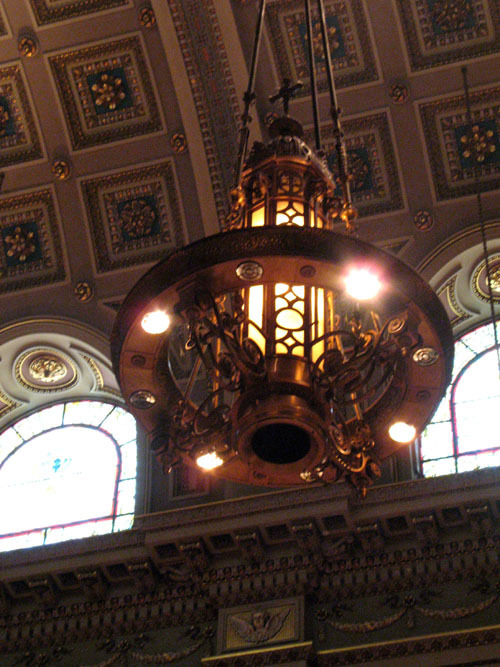 In a really insulting pre-mass announcement, the lector requested that everybody be extra generous with their donations, because they are a small parish, and it can be a challenge to maintain such an old, beautiful basilica. I had to pick my jaw up off the floor for that one. It's on the parkway, but parking is, ironically, virtually impossible. Don't even try. Just take public transit, make a day of it and see the sights, and be thankful you don't have to worry about your car. You'll be happier without it. Trust me. 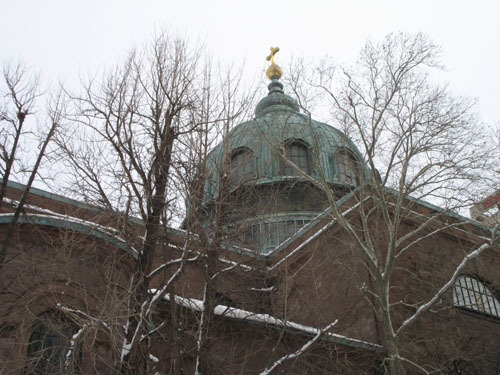 Despite being a tourist attraction, the parkway area closest to the Basilica and center city is often overrun with homeless derelicts. They seem mostly harmless, but don't be shocked if you see human flotsam everywhere. Oh, and the church does offer tours after some masses (including some for children, too! ), so leave yourself some extra time in case you want to partake. The Project didn't have time, but I'm sure it's fascinating. 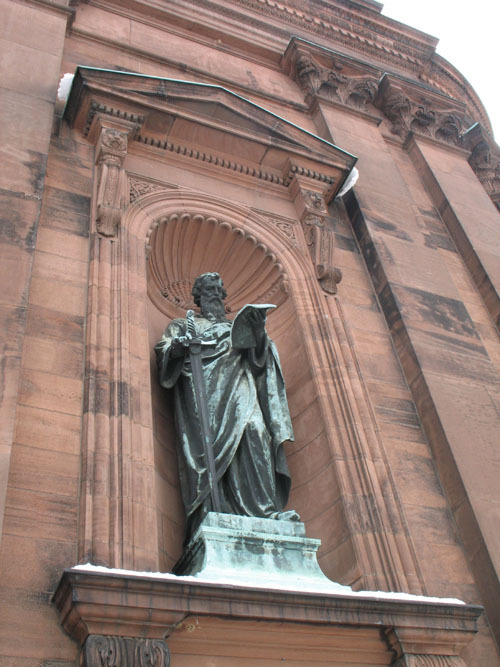 Longtime readers will note that I've often held Immaculate Conception to be the city's largest church. 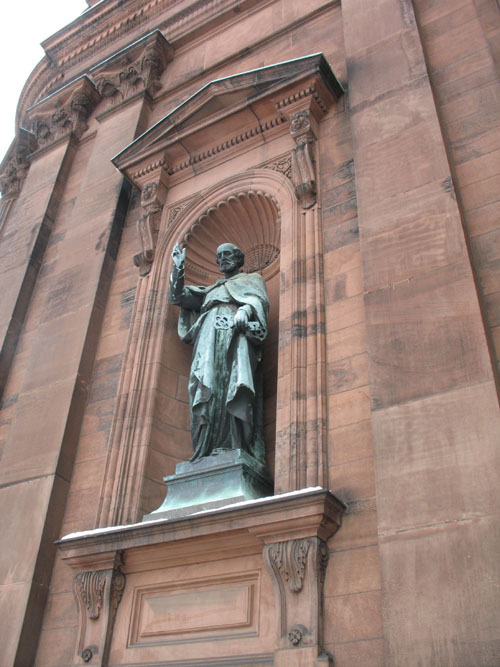 In reality it's something of a toss-up between it and the Basilica. 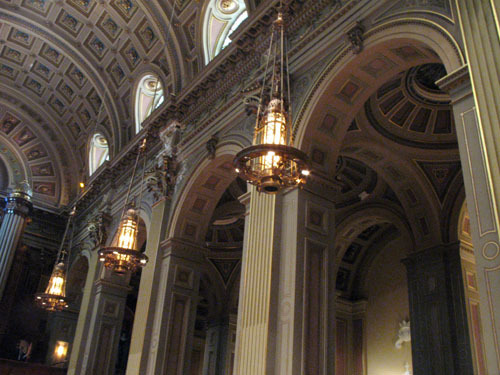 Immaculate has more permanent seating (1,400 to 1,200), but the Basilica's generous side arcades can accommodate temporary seating that pushes their capacity to nearly 2,000. My own unscientific eyes and sense of space tell me that Immaculate is larger, but it's not inconceivable that the arcades and sanctuary push the basilica over the edge. Of course, it's probably moot now since Immaculate closed in 2012. But it's still a point I'll belabor, as long as Immaculate stands in one form or another. One you should probably see, even if you don't particularly want to.